Welcome to my blog and thank you for reading! 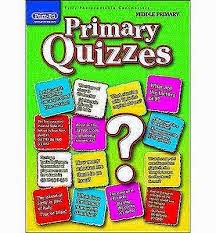 I am reviewing another new resource of mine today, Prim-Ed Primary Quizzes. If you are a regular reader of my blog, then you may have guessed that I like to be organised! I really don’t like the unexpected. My absolute worst nightmare (I have had this nightmare before) is to arrive into a classroom to find you have nothing planned, nor has the teacher left a plan. Teaching is the one profession where you simply cannot get away with not planning and being unprepared. Therefore, I arrive in classrooms well-armed! I ordered the Primary Quizzes resource for those days where children simply are not in the form for doing ‘proper work’. We all know those days. It may be in the run up to holidays. It may be that they were at a football match all day and arrive back at school with only an hour until home time. Will they feel like doing maths? Not in my experience! I had lots of these days this June. It was so near the end of term, there were sports days taking place, school tours etc. This led to the children having very short attention spans and a general disinterest in work, especially after the standardised testing. Anyway, I digress. I find these days difficult in a sense, because it’s hard to know how to pass the time. I downloaded a brilliant quiz from Seomra Ranga last term, which was wonderful for the last twenty minutes of the day after swimming or some school excursion. I have used it to death however and need a new quiz! I looked on-line but again, it took me ages and I found it hard to find quizzes which were 100% suited to our curriculum. A lot of them were American and based on American history. So then, I found this! A whole book of quizzes! It is perfect for those haphazard days. It contains a whopping FORTY quizzes. I chose the middle primary book, as I felt some of the questions could be extended to the senior classes, but now I want the whole set of quiz books! It’s great to have a bit of competition in the classroom too, it really spurs the children on. I would have a little prize for the winning team ( and runner up prizes) and you are set. There is a teacher page with this resource too which I really didn’t expect but was very happy to see! It tells you the areas to cover prior to holding the quiz. If you are only subbing for a day this might not be possible, but if you have a few days with the same class then it’s a good idea. It also has a ‘Further Exploration’ section, with loads of brilliant follow on ideas, e.g. ‘Research different species of pythons to find out how they capture and consume their prey’. I love follow on activities. It looks good too, to show that you linked your lessons throughout the day, rather than using random worksheets. Each quiz contains fifteen class appropriate questions, which are based on many different subjects, from maths to history. If you have a permanent job, I think the quizzes would be a lovely end of the week treat for Fridays. If I had my own class, I would make quite a spectacle of the quiz. I would tell the children of the topics which may come up in the quiz so they could research them, I would have the prizes on show in the Quiz Prize cupboard, and I would have the teams picked and written on the Quiz Board. Maybe if one team won three times in a row, they might get a special prize, like Golden Time or something to that effect. If presented properly, the humble quiz could be quite the event! It would also be great practice for the Credit Union quizzes. I am actually going to order the lower primary quiz book too, because I think the little ones would find it really exciting! They are half price at the moment I just got two of them for €19!